Tylenol During Pregnancy: Is There An Effect On Kids' Behavior? : Shots - Health News A study found that behavioral problems were more common among children of women who took the pain reliever during pregnancy. But interpreting the results isn't as straightforward as you might expect. 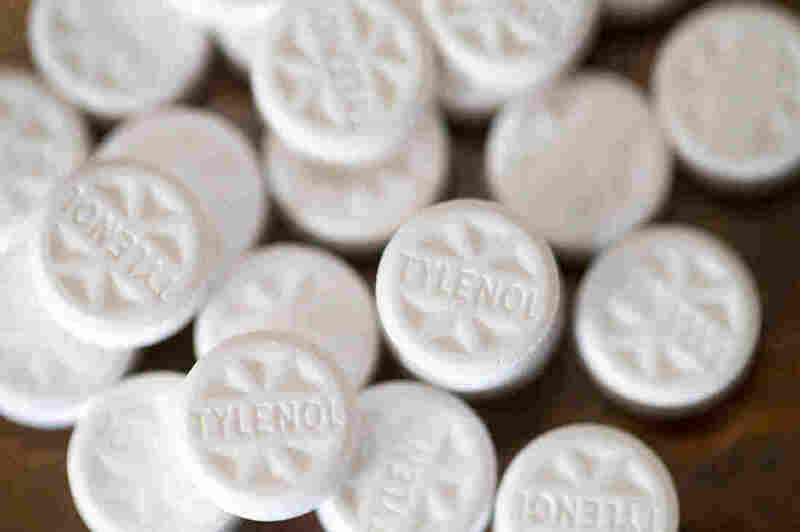 Acetaminophen, which is sold under the brand name Tylenol, may carry underappreciated risks. But teasing out their magnitude is a challenge. One study now caught in that eddy is a report reporting behavioral problems in children born to women who took acetaminophen (popular brand name: Tylenol) during pregnancy. Evie Stergiakouli and George Davey Smith at the University of Bristol published it Monday in JAMA Pediatrics. They studied about 7,800 women and their children over the course of more than seven years. There's no question the study addresses an important topic. About half of all pregnant women take acetaminophen during pregnancy because it's considered safer than other painkillers. And hyperactivity and other behavioral problems in childhood are common and potentially disruptive. The study reports that these behavioral problems were about 20 to 45 percent more common among the children of women who took acetaminophen during pregnancy. So it sounds like a pretty important finding, right? Well, it's not quite so simple. On the one hand, two previous studies have shown similar results. So this finding isn't out of the blue. One advantage of this study is it asked women –while they were pregnant — whether they took acetaminophen, so the findings weren't as prone to faulty memories, which can be a problem in studies like this. On the other hand, the researchers didn't ask women how much of the drug they took, and they didn't ask why they took it. The women who took acetaminophen were somewhat more likely to report that they smoked during their pregnancies, that they drank alcohol and that they suffered from psychiatric illness. When the researchers mathematically factored out those confounding observations, the effect disappeared entirely for some subgroups and was diminished in the others. So is this finding significant? Remember, the researchers said they saw increases ranging from about 20 to 45 percent in behavioral issues among the children whose mothers took acetaminophen (measured at the age of 7 with a test called the Strengths and Difficulties Questionnaire). But what do those percentages really mean? It turns out you can't answer that question fully by reading the paper alone. You have to dig into the supplementary data tables posted online. The 20 percent to 45 percent increase is actually a small change. To pick one representative endpoint: Among women who had not taken the drug, 4.3 percent of their children registered an elevated score on the "SDQ total difficulties" test. Compare that with 6.3 percent of children born to women who did take the drug. So, the risk went from a small percentage to a slightly less small percentage of these children. First of all, a change that small is never easy to measure. The study concludes it's unlikely to be a statistical fluke, but that's not the only kind of uncertainty that can creep into a study like this. Scientists always have to worry about whether their findings are biased by some factor they hadn't even considered. And for findings this small, bias is always a worry. The small increase in absolute risk could be reassuring to women who need to take a painkiller during pregnancy. If the drug is indeed tipping the scale, it's not tilting it very much. And remember, the risk in this study generally faded — or even disappeared entirely, depending on the subtype of the SDQ test — when adjusted for smoking, drinking and reported psychiatric problems. On the other hand, because many women use acetaminophen during pregnancy, even a small effect can matter across the entire population. It's a public health issue worth understanding. Last year the Food and Drug Administration weighed in on the previous studies of pain medication during pregnancy: "We found all of the studies we reviewed to have potential limitations in their designs; sometimes the accumulated studies on a topic contained conflicting results that prevented us from drawing reliable conclusions." The agency's advice was: Ask your doctor. That advice still stands.